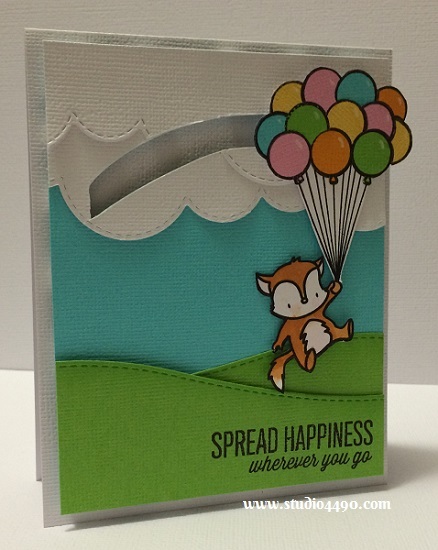 My idea was to make a moving card especially when I saw the sentiment “Spread Happiness wherever you go”. I had all the pieces almost ready to assemble when I decided that the cotton thread might not be strong enough to pull the little critter across the card. At that moment I decide to anchor all the pieces and I’m pretty happy with how it turned out. 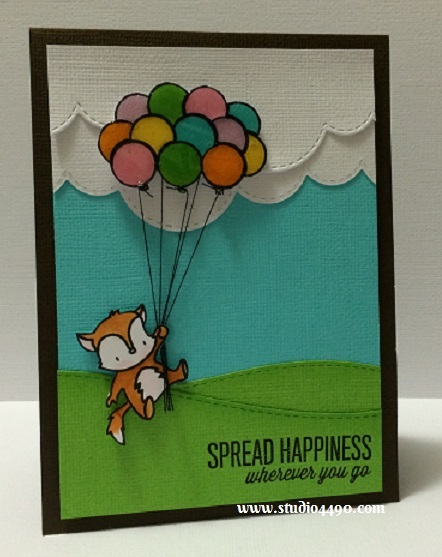 Materials used: Stamps – Up and Away (Mama Elephant); Dies – Creative Cuts – Landscape Trio (Mama Elephant); Mister Hueys Colour Mist – Shine (Studio Calico); and Distress Markers. 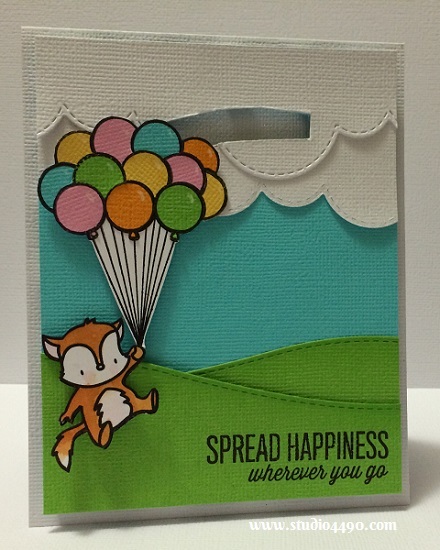 Of course I always stamp up (and usually I colour them too) multiple images when I create so I decided to try my moving card again but this time I would I wouldn’t separate the balloons and the strings. I was partially worried by the appearance of the white behind the string and toyed with the idea of sponging ink but now that it is finished I’m not unhappy with the white. I’m sorry the photographs aren’t the best – one of the downsides to being a nighttime crafter, especially during winter. Okay, I am totally behind in commenting because I’m living in land of disorganized! My apologies…but here I am, again dazzled and delighted by your creativity! Seriously, how darling is this interactive card (perfection is the only thing I see!) with the wee fox flyyyyinnnng across the landscape buoyed by his beautiful balloons. “Up, up and away”, indeed – in you amazing, always spectacular style! Super cuteness! You and ME are forging a mighty strong relationship!! Off to see your next post….the promise of dingo puppies has me intrigued!! I saw your card in the gallery at Stretch Your Stamps 2, and just had to come take a look. I love BOTH your cards! Glad you did the moving card–it does go perfectly with the greeting. And the white behind the balloon strings is OK. I think the fact that it’s an interactive card negates any “problem” with having the white! 🙂 And I think your coloring on both images is wonderful. Tfs! Thank you so much, Andrea! What a lovely comment. Thank you too for the feedback regarding the strings – it’s great to get another opinion on it. 🙂 Have a great day! Oh, Kylie, this would be such a fun card to receive! I love the interactive element, especially. I have not been brave enough to attempt anything like it yet, so seeing it in action is thrilling and wonderful!